Naturally drying plenty of clothes outdoors, leaving them fresh and wrinkle free. 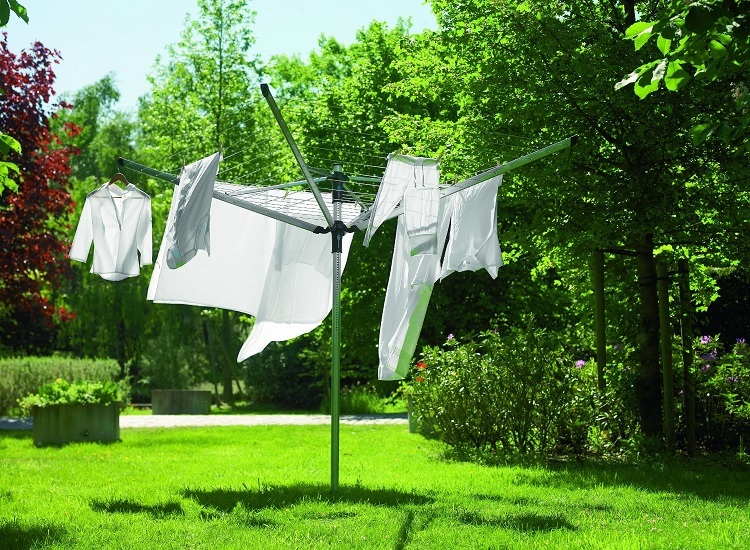 Your clothes will end up smelling fresh with less creases when dried naturally outdoors with an outdoor airer. Here are 5 of the best rotary washing lines of 2018 that will give you plenty of space to dry a big load of clothes. 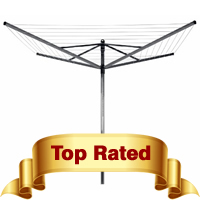 Dry Space Options – How much drying space does the rotary washing line have? Certain models gives you a selection to choose from. 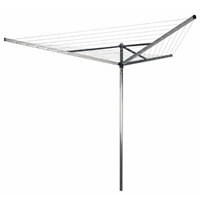 Arms – How many arms (washing line supports) does it have? Height – This is measured from the bottom of the pole to the top of the pole. 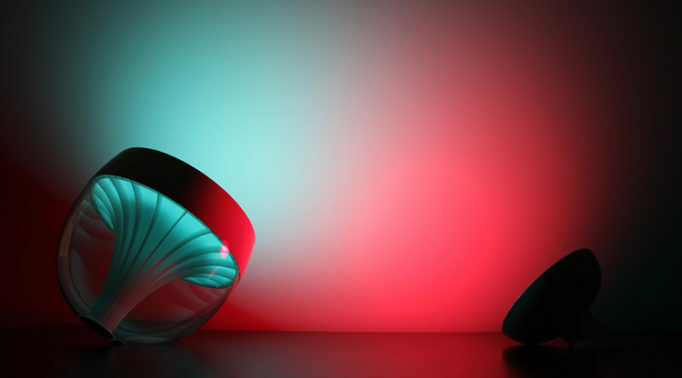 Some models have a function which allows you to adjust the height of the pole. Pole Width – What’s the diameter of the center pole? 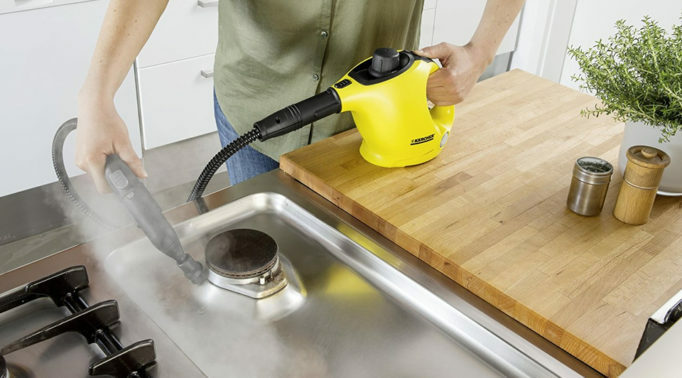 The following sections will guide you on what to look for in a rotary drying frame to ensure you buy a good quality one. Rotary clothes lines are usually designed to be free standing as it is stabbed into the lawn in your garden. However, not everyone will have a lawn in their garden. If this is the case, it’s best to look for airers that can be mounted to your wall. Wall mountable clothes airers are permanently fixed to the wall so check that a storage box is a part of the fixture. 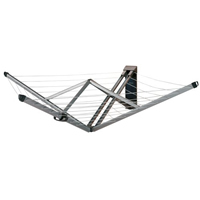 This is so you can fold your airer into the storage box to keep it clean, prevent damage and save space. 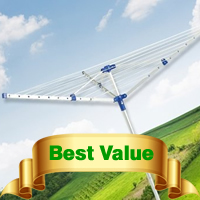 The pole of the clothes line should ideally be made from stainless steel. Galvanised steel is the best option as it is much stronger but it can be fairly expensive. Rotary washing lines should include the ground spike or soil spear which helps to keep your rotary drying frame grounded. This is a necessary piece as it helps to fix the airer into place for stability as well as ensuring your clothesline doesn’t get blown over so easily when there are strong winds. Usually there are 4 arms on rotary airers which hold the clothes lines up. Some models will have a hole on the end of each arm for hangers. This is ideal for hanging formal shirts or other clothing that you do not want creased. A conventional rotary washing line provides a lot of hanging space though a big garden is required. Some rotary drying frames are designed to open up with an umbrella mechanism and some will have a traditional winding handle mechanism. 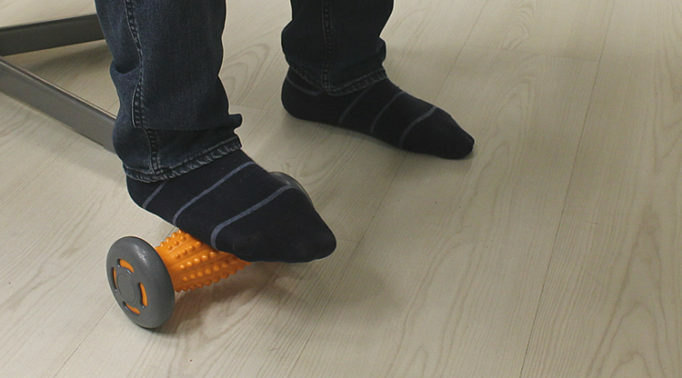 The umbrella mechanism is a simple push up until it locks into place. However, this is not ideal if you have a bad back or shoulders. Instead, look for airers that have a smart lift mechanism which will not require you to bend down to lift. When it is fully opened, the clothesline should be taut but make sure the lines can be pulled a tiny bit. Lines that are too tight can cause too much strain on the lines making it wear out faster and snap. Most washing lines are made with a plastic material but check the lines on your clothes airer are reinforced with metal wire. This will help to prevent the lines from sagging and ensure heavier clothing can be hung on them. Look for washing lines that are UV resistant as well which will protect your lines from damage and ensure they last a long time. When the rotary washing line is collapsed, the lines are often left hanging loose. These lines can get tangled which can cause them to weaken as well as being a hassle to untangle. To keep the lines from tangling, look for a tie cord attachment which will secure the arms to the pole. Alternatively, a PVC cover may be bought instead which will help to prevent the clotheslines from tangling and damage. Having this is ideal as it means you will not have to take your washing line out of the ground to store away. Instead, it can stay where it is with the cover. Make sure you get one that fits over your washing line perfectly to keep the arms and lines as close to the pole as possible. Each rotary washing line will have a different number of tiers (lines) which determines the amount of drying space you will have. Of course, the more tiers there are, the bigger the dimension of the washing line will be. Look for one that will be big enough for your needs. For example, an 8 tier one will measure around 5m diameter of your garden space but it’s enough for a family of 5 or more. It is important to choose one that will fit in your garden and still have enough space around the airer for it to rotate. The diameter of the centre pole is an important point to check because the bigger the size of the rotary airer, the centre pole diameter needs to be big as well. This is to ensure it is thick and sturdy enough to hold all your clothes on the washing line. 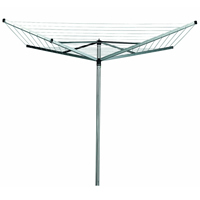 For example, Brabantia rotary washing lines measuring 50m in line space will usually have a 45mm centre pole which is thick enough to hold a family load of clothes. The height on rotary washing lines can be adjusted to your ideal height which will make it easier to hang your washing out. It’s best to check whether the airer has a low loading position as well as the height range as each one will vary. It’s worth checking out Brabantia rotary dryers as this brand is designed to be British weather-proof. The frames are strong and durable but it is still lightweight and is simple to set up. They also have a wide range of sizes available as well as a 5 year guarantee so you can’t go wrong with one of these. Here’s a video by B&Q on how to install a rotary washing line in your back garden. Why Buy a Rotary Washing Line? 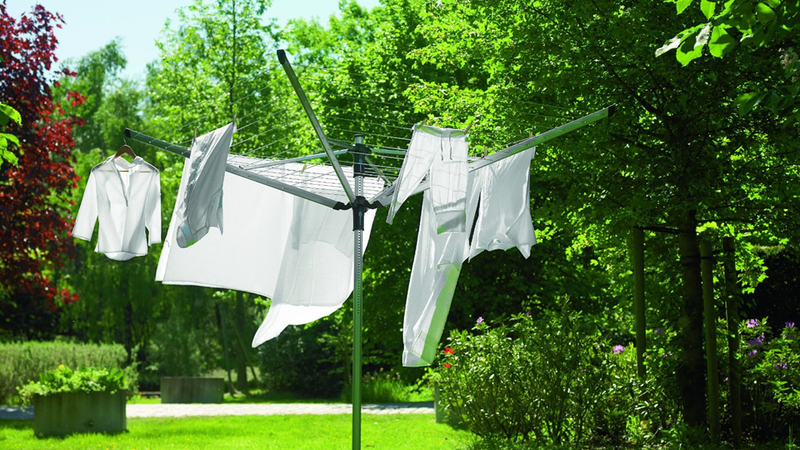 If you’re lucky enough to have a big enough garden, a rotary washing line will help to dry your clothes evenly and naturally. This will rotate in the wind which ensures each item of clothing will get a turn in the sun. It’s fairly easy to install as there’s a spike at the bottom of the pole which sticks into the lawn in your garden. This washing line does not have to be a permanent feature in your garden as it can be stored away when it’s not in use. Rotary airers can be folded up into a more compact object for easy storage which is ideal if your garden is fairly small. Anti-Bacterial Effects: UV rays from the sun kills any surviving bacteria after a cool wash.
Bleaching: The sunlight helps to bleach your whites. 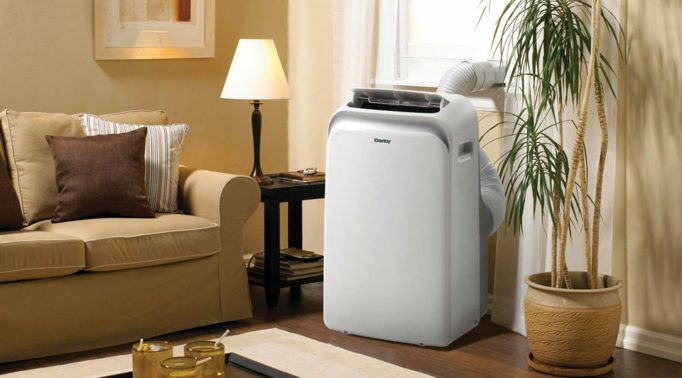 Energy Saving: A tumble dryer is very costly to use. Environmentally Friendly: Pollution is reduced. Clothes Last Longer: Your clothing will not get damaged, shrink or fade in colour. The best time to purchase a rotary washing line is when you start to see more sunshine – ideally before summer begins. 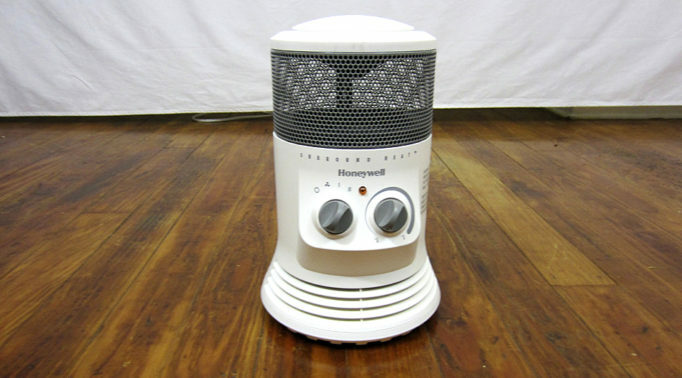 It can still be used throughout cold seasons as long as it is a sunny day. Can you tell me do you have anybody that would untangle my rotary drier? Thank you. Hi Patricia, we don’t offer home services I’m afraid, we only recommend products and guides. Have had numerous rotary driers but as I have a very windy corner they all bend over and break. Any advice . Bought all prices of driers not had a success yet. 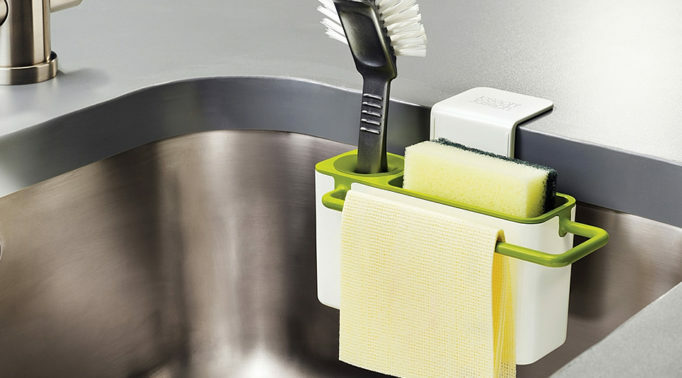 Hi Penny, have you tried the Brabantia WallFix? 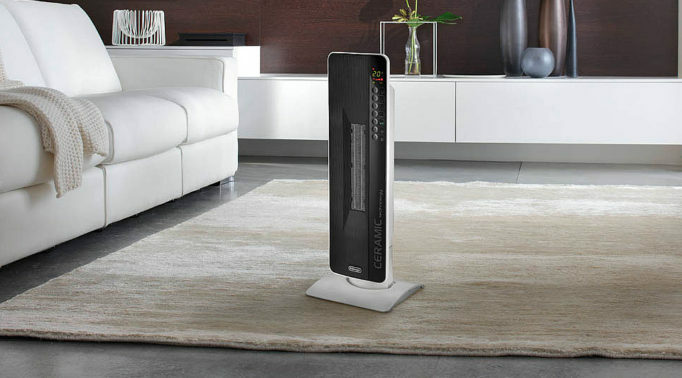 Granted, it needs to be fixed to a wall but it can be folded inwards to save space and to protect the airer itself. Hi… Do you do a model with 50mm pole diameter? Hi Rob, the Brabantia Lift-O-Matic Advance and Brabantia SmartLift features a 50mm diameter pole, as does the Minky Rota Lift. How robust is the “fixing of the cap” on the top of the pole of modern dryers. Frequently, from experience, the caps easily break and come off partcularly with umbrella type devices. Hi Chris, that largely depends on what product/brand you go with. That being said, Brabantia usually tends to be reliable and consistent with their production quality.